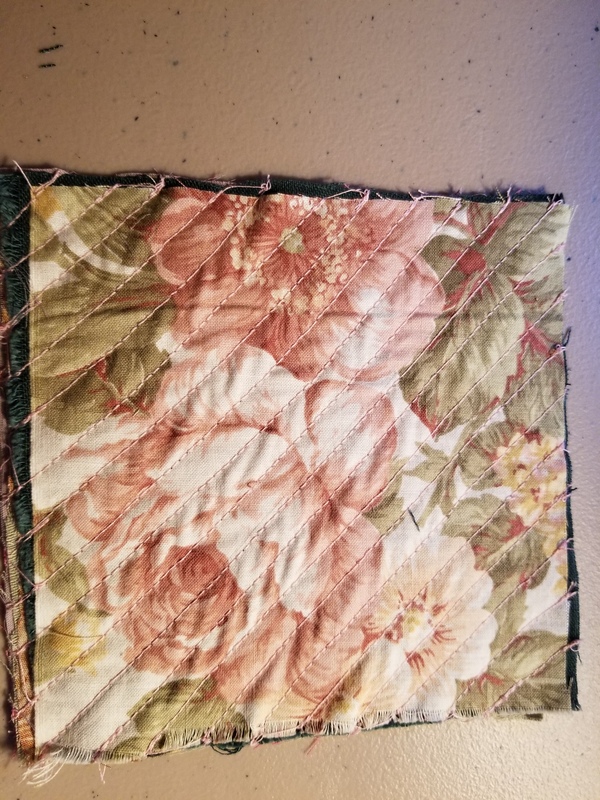 Old Hand Stitched Projects, What to Do? In the quest to clean out some of the “stuff” in my studio, I found a couple of old projects that are hanging around either not finished or in the “why did I think this was a good idea” pile. 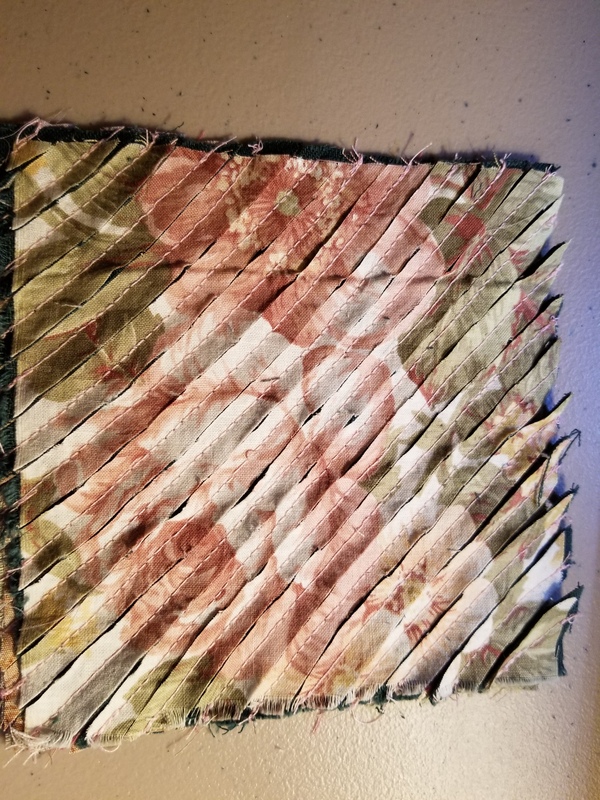 The first is a printed sample from one of my online classes and I added some hand stitching. I wanted to brighten it up a bit but then I think I might have gone past my comfort zone. I couldn’t decide if I should just keep adding more stitching or if it should be left as it is. As you can see by the side view it is lumpy, wavy and uneven. 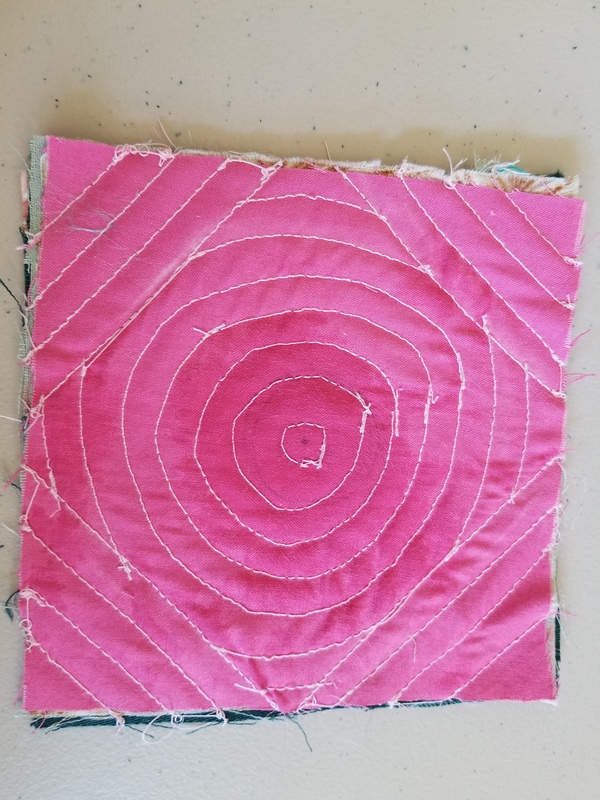 The circles stitched on the felt caused the felt to buckle and push outward. What would you suggest? Would you add more stitching? Just use it as is? Cut it up? Throw it away? What would you make out of it? I’ve love to hear your suggestions. 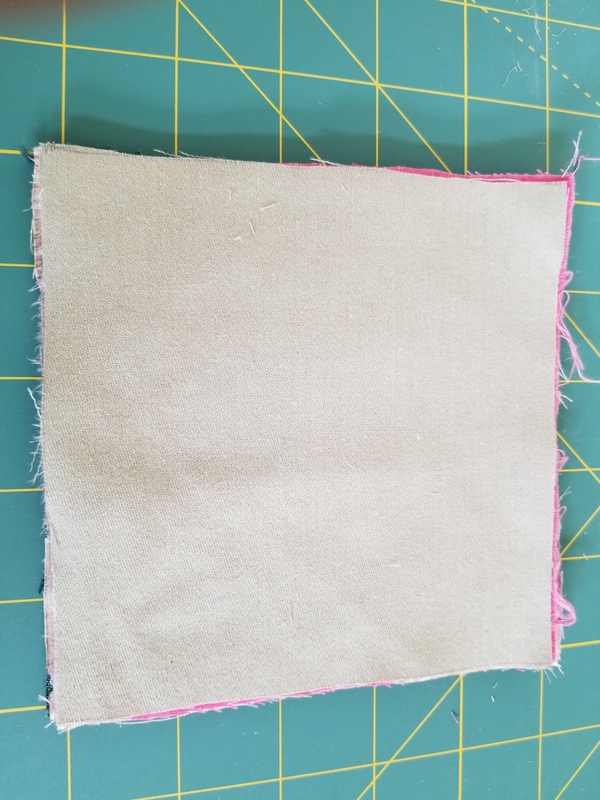 Here’s a little felt book that I started. 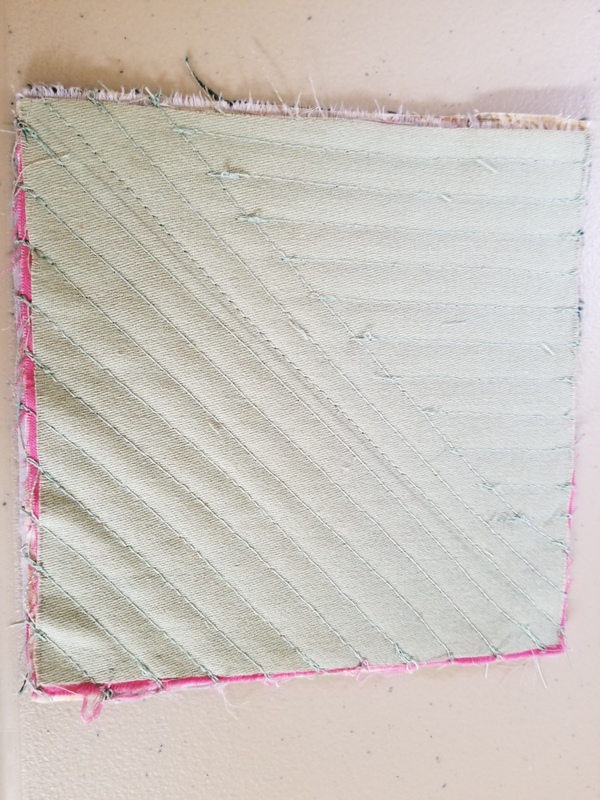 I think I was mainly using this to make the binding but then decided I should stitch on the pages. The photo above shows the front cover. And here’s the second page. I have three more pages that are not finished. I either got bored or couldn’t decide what to do on the last three pages. Perhaps I will look through my floral sketches and find some patterns that might work for those last three pages. The felt on this book is commercial felt in case you were wondering. And I thought I would show this hand felted hat that I completed with embroidery. I’m not sure I have shown it before and it was hanging out in the studio with no better place to be. What do you do with finished pieces that are taking up space in your studio? An old music hall song’s opening line is: “Oh, I do like to be beside the seaside”. And who doesn’t? So this quarter the challenge is to make a seascape and it doesn’t have to be just ‘sea’. You might include beaches, yachts, lighthouses, seabirds, piers etc. 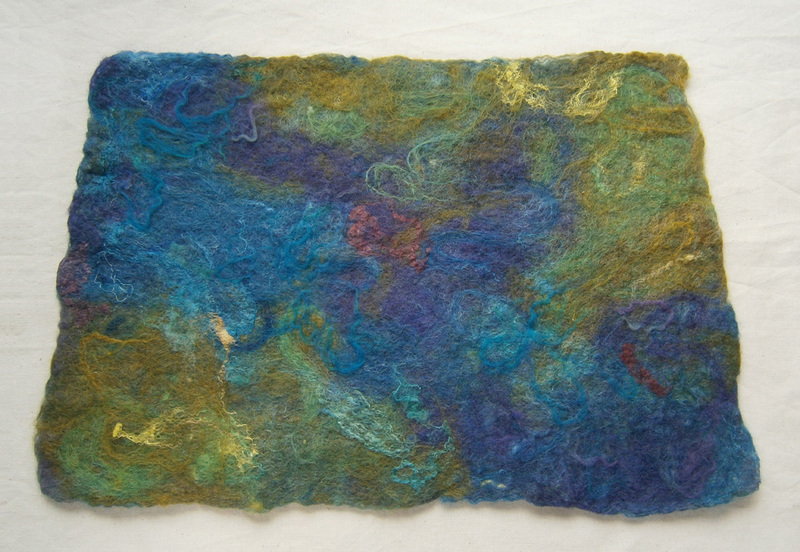 The Felting Forum embraces all things fibre and mixed media, so do your favourite thing or have a go at something new! As in the previous challenge, size doesn’t matter and it doesn’t have to be wall art – your seascape could feature on clothing, a vessel or a mug mat. 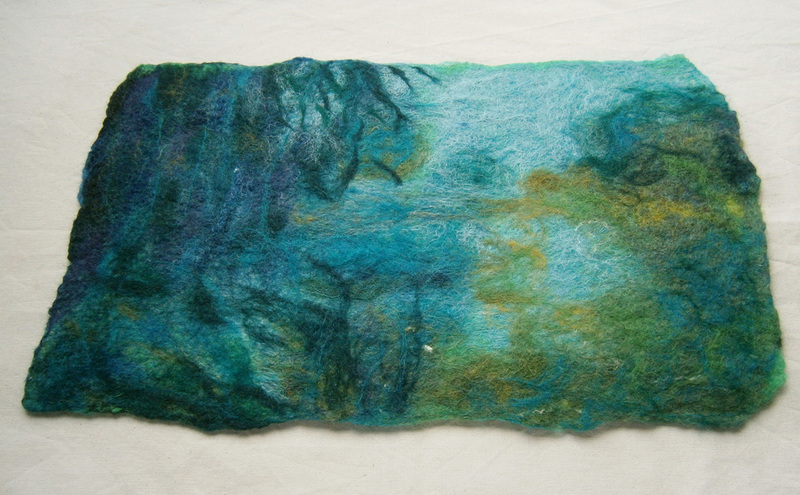 Annie (rosiepink) made this sea/sky image with dry wool fibres. 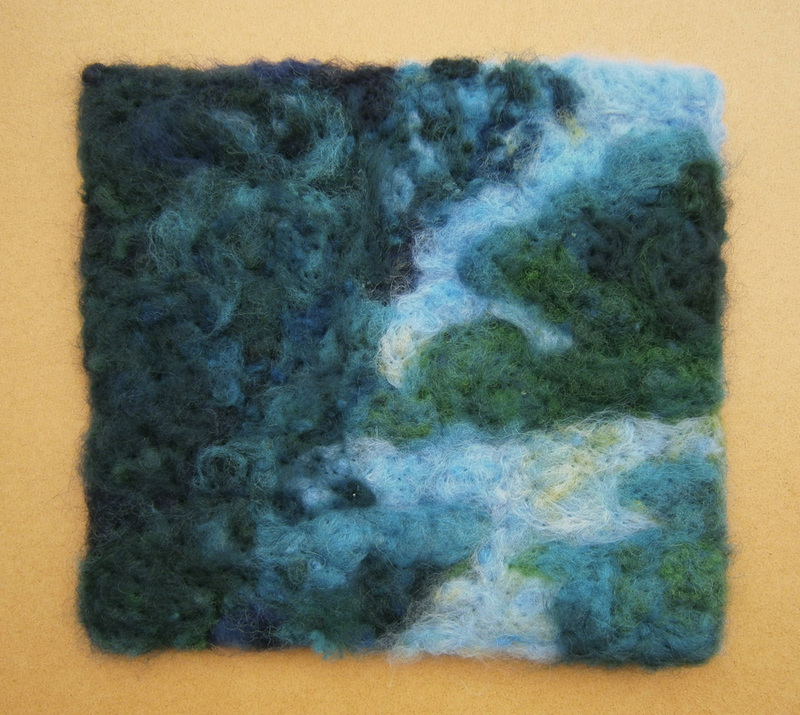 Un-felted fibre pictures can be photographed then the images printed to make wall art. Or the fibres can be trapped under glass then framed. Annie (rosiepink) made this nuno seascape with wisps of fibres and open-weave fabrics, then soaked it with CMC paste, scrunched it up a bit then let it dry. It’s stiff enough to hang on a nail in the wall! Here’s a part of it in close-up. We hope you’ve been inspired to have a go at this challenge! It would be lovely to see some new seascapes on the forum. I attended a local event yesterday called PechaKucha. I had never heard of it before and thought you might like to hear a little more about it. The idea began in Tokyo in 2003, when architects Astrid Klein and Mark Dytham devised a format to present creative ideas informally and in a more relaxed setting. The format for presentation is to show 20 images, each for 20 seconds with the images advancing automatically. This gives the presenter 20 seconds to talk about each image or to tell their story with photos. 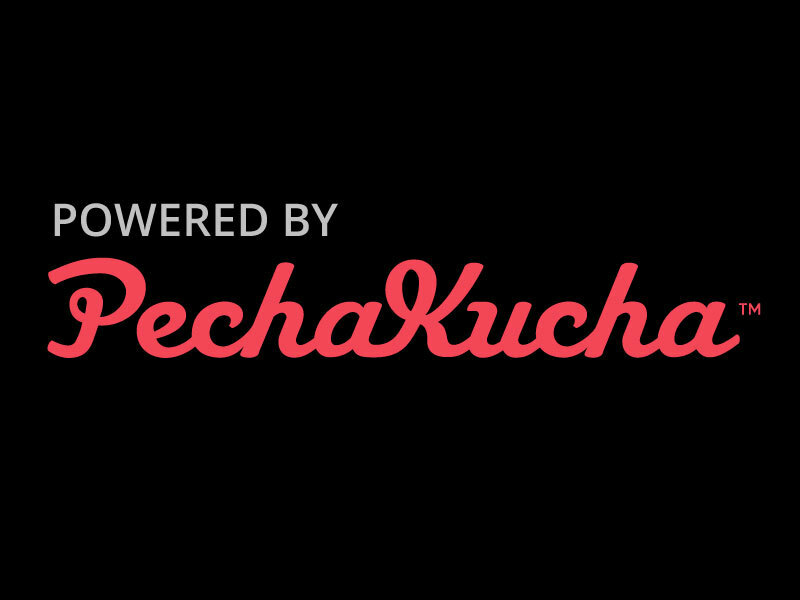 Please go visit their site to learn more about the PechaKucha movement and see if there is an event near you. PechaKucha events have spread to over 1,000 cities throughout the world. The events provide a place for creative people to get together and share what they have been creating, their stories, thoughts or just their holiday/vacation photos. The great thing about these events is that anyone can present. There are no set rules on what can be presented but what works the best is sharing your passion or something you love. It allows people to tell others their story and what is presented is often unexpected, sometimes poignant or humorous, sometimes very personal but always different. The local event that I attended had nine presenters including a potter, a mixed media artist, a graphic designer, a photographer, a web developer, a textile designer, an iron sculptor, a master boot maker and a travel photographer. Here are a few photos from the Kalispell event. Sorry about the quality but it’s what I could get with my phone. The recording of the event will be uploaded to the main website in the next several days. The venue was quite small for the number of people who came but we still enjoyed the event. This session was focused on art and design, all of the presenters were from the valley and everyone’s story was very different. 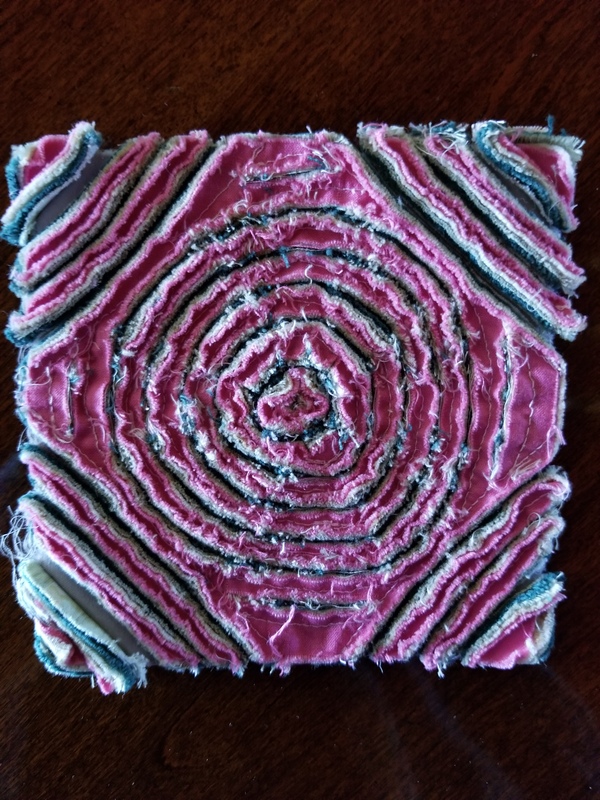 I think this would be a wonderful way to spread the word about felt making and fiber art. If I get up the nerve, I may try presenting at a future event. Looking at the global map on the PechaKucha site, it looks like most people will be able to find an event near where they live. If not, you can visit the site and take a look at some presentations given in the past. Or, if you really want to be brave, you could start a PechaKucha event in your town (as long as there isn’t already another one going). You need to hold an event four times a year to qualify and you can get more information here. Hello again. I know its been a long time since I’ve posted and I sincerely thank everyone who has contributed to the blog in my place. I definitely feel it has enriched our community and broadened our scope. Because of health issues in our family, I haven’t been doing much creative work. 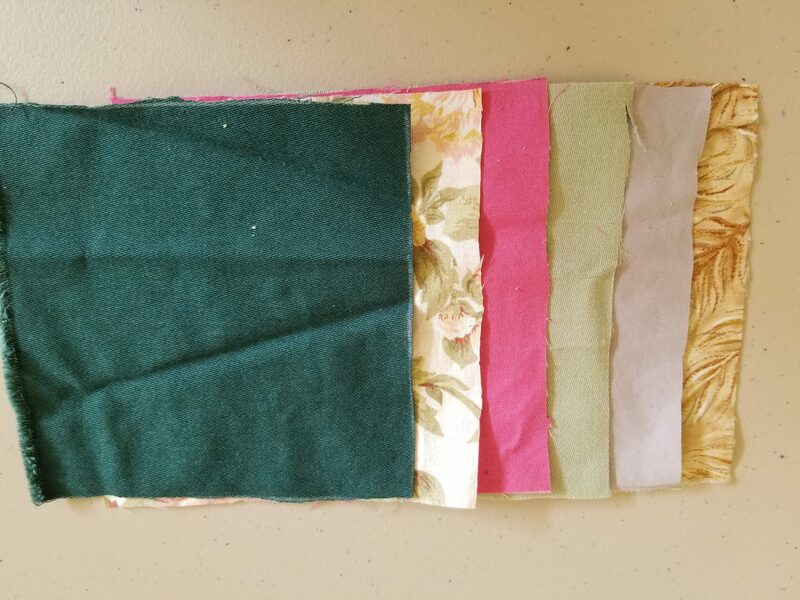 But managed to do a little fabric manipulation with fabric scraps. 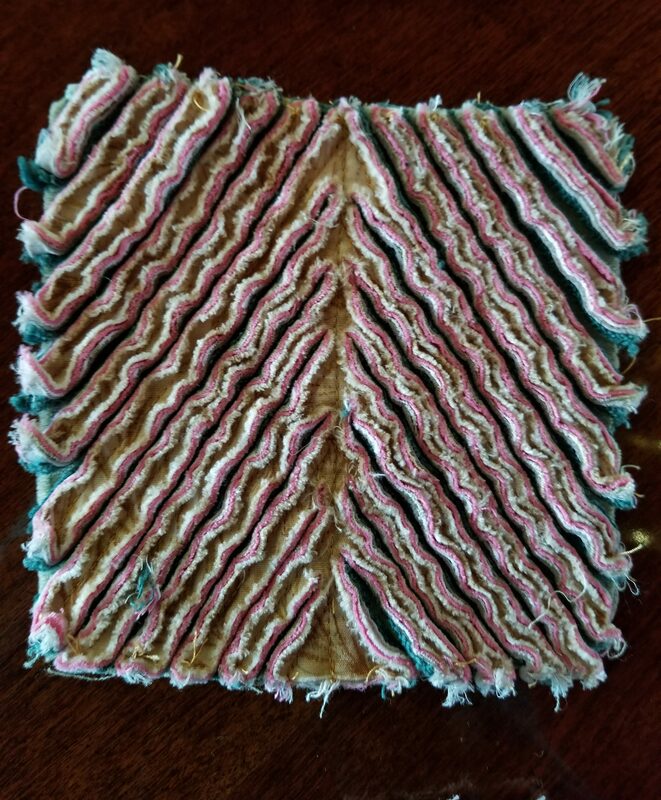 I had bought a book a long time ago by Ann Small, Layered Cloth, The Art of Fabric Manipulation. Anyone who knows me or followed me knows I love texture. I was intrigued. Plus it was something I could work on a little at a time. 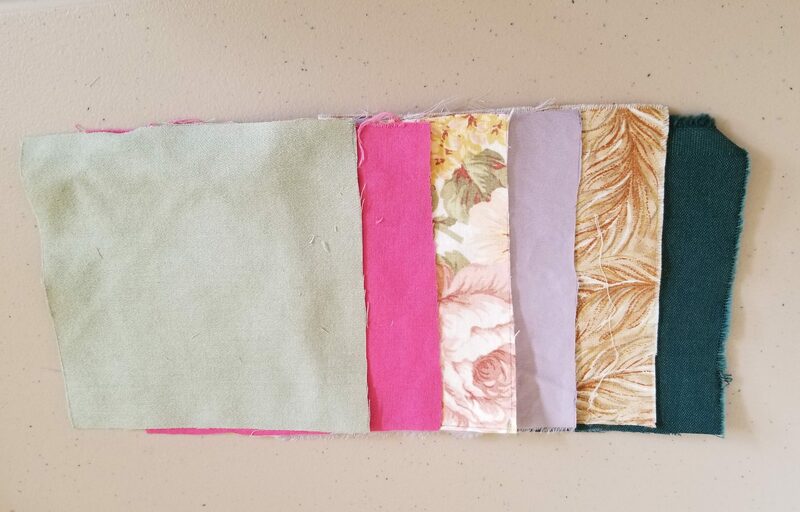 Like everyone else, I collect all things fiber and found a stash of five fabric pieces I had bought at a thrift store. Perfect, but I needed one more for six layers. No problem. I had an old Egyptian cotton sheet laying around I had used several years ago to make small pillowcases. 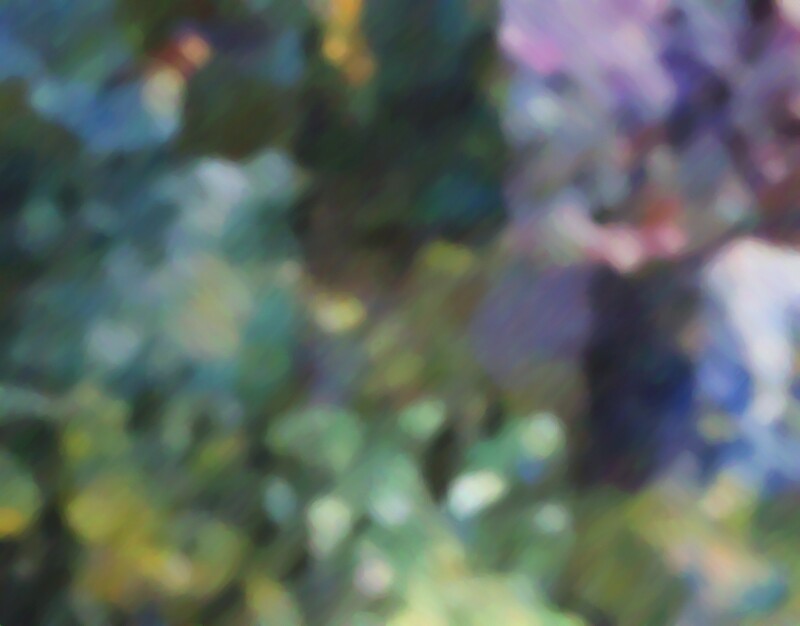 I wasn’t too concerned with colors, but it worked out fairly well. 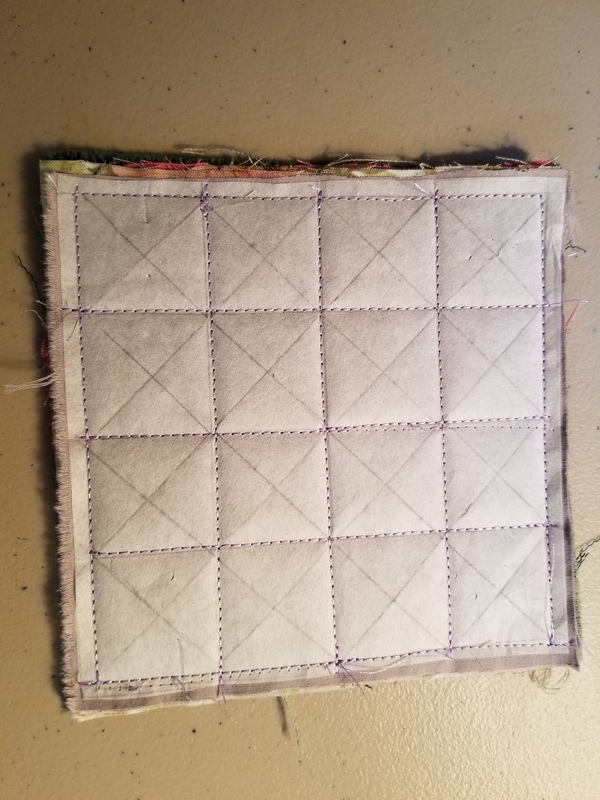 I cut five inch squares out of each cloth. They are different weights of cotton and or blends. My first sandwich. Excuse the shadows the light wasn’t very good. The book gives many examples of patterns. I was really excited to experiment. I started in the middle and using the width of the presser foot to make the next row. I assembled a variety of tools, not knowing which would work best going through five layers. The blue scissors proved to be most useful on most of them. Although my hands were not happy with me. If you look closely at the pic above on the right, you’ll notice how stringy the one corner is. This is because it was cut on the grain. 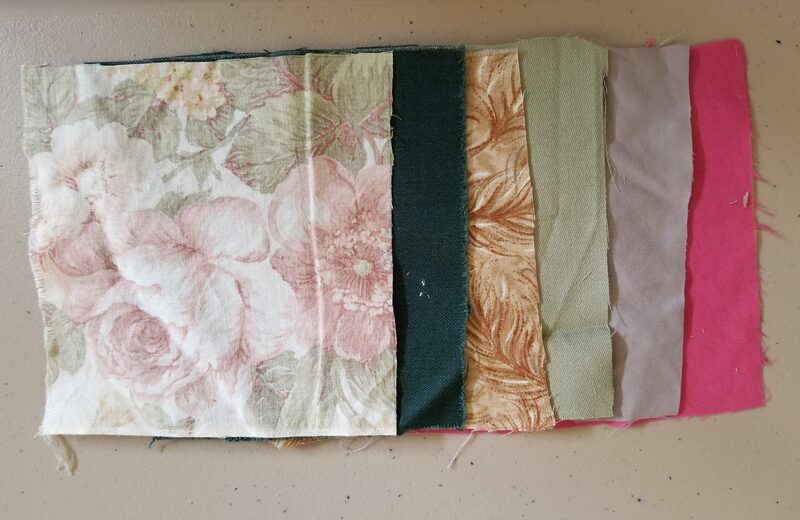 For the next five sandwiches I alternated fabrics and designs. 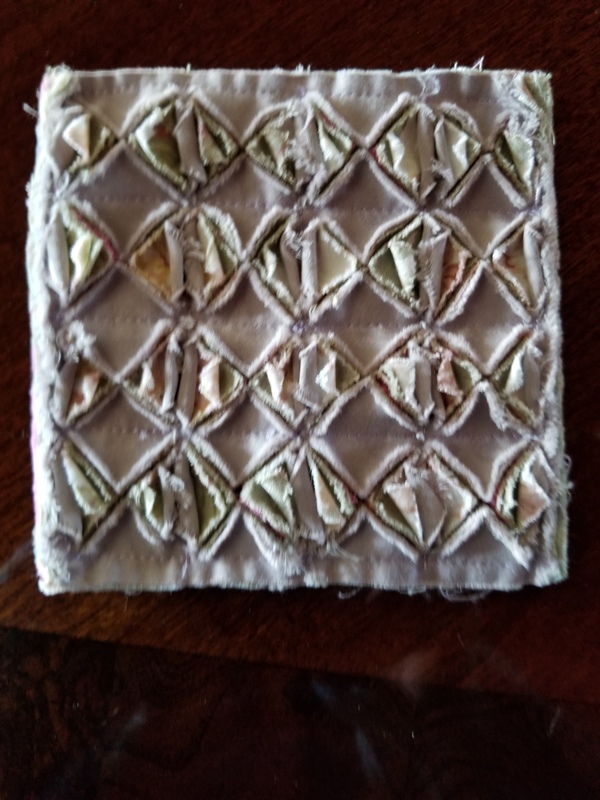 After stitching and cutting, I roughed up the samples to get them to open up. After being washed and dried. The circular design was difficult to cut through the layers. 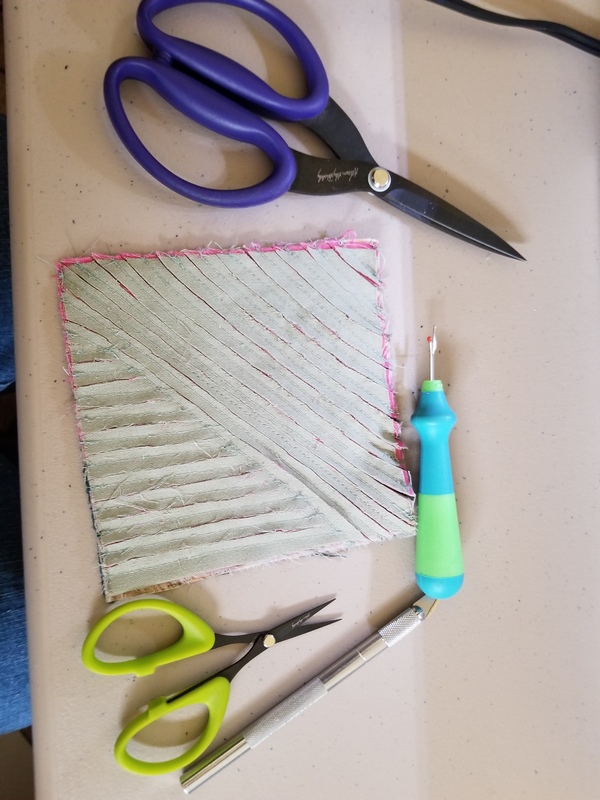 I had to use the seam ripper to open it up far enough to get the scissors in and hope I’d get through the first five layers and not cut all six. 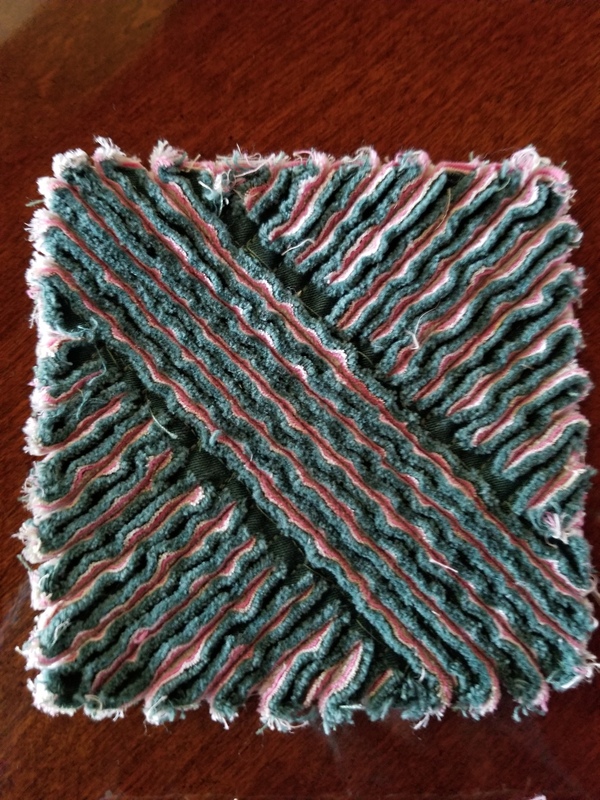 The finished piece is very thready even after washing twice, dried in the dryer. On the following one I decided to slash squares. 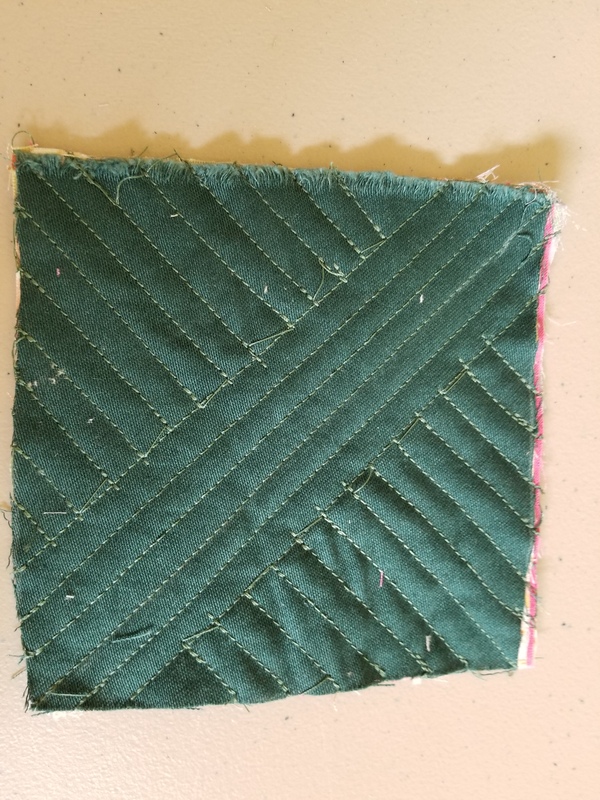 So I used a piece of stitch and tear to draw my pattern then stitched it to the sandwich and followed the square pattern. Again I had to use the seam ripper to get started. After stitching, slashing, washing twice and drying, here is the result. I found it interesting that not all squares opened, but every other row did creating it’s own pattern. Here are all six of them together after they were washed, dried and trimmed. 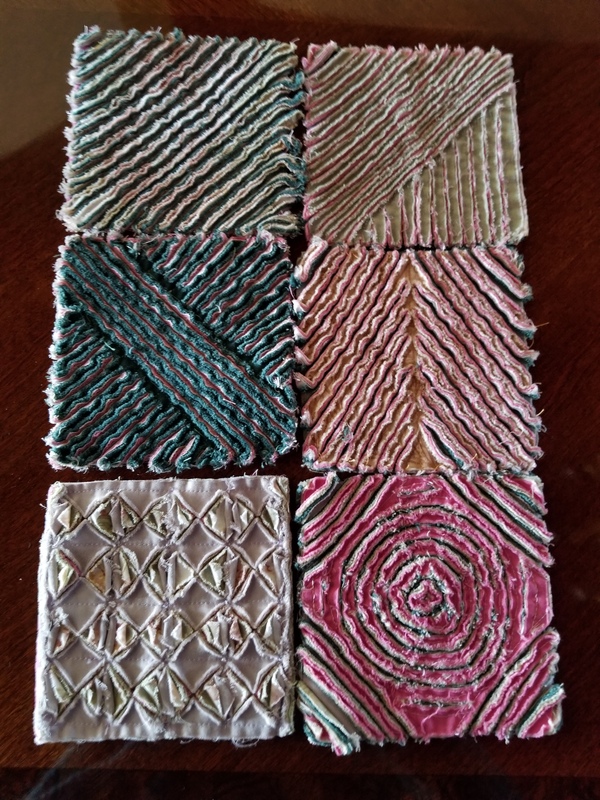 I have to say the pink is my least favorite, but it was a fun project to see how different each pattern turned out. I’m sure using different fabrics and perhaps even using a tie dye type fabric you can get some really fun outcomes. Have you ever tried this? I’m not sure what I’ll do with them now. Any suggestions? All classes are online and last a total of 6 weeks with 4 weeks of instruction and 2 more extra weeks of tutor/instructor support. All classes are taught with PDF’s and videos. PDF’s are available for download for future use and videos are available for the 6 week time period. Classes will begin April 19th and cost $45 US each. I would recommend taking the classes one at a time. There will be another session of classes offered in the fall. 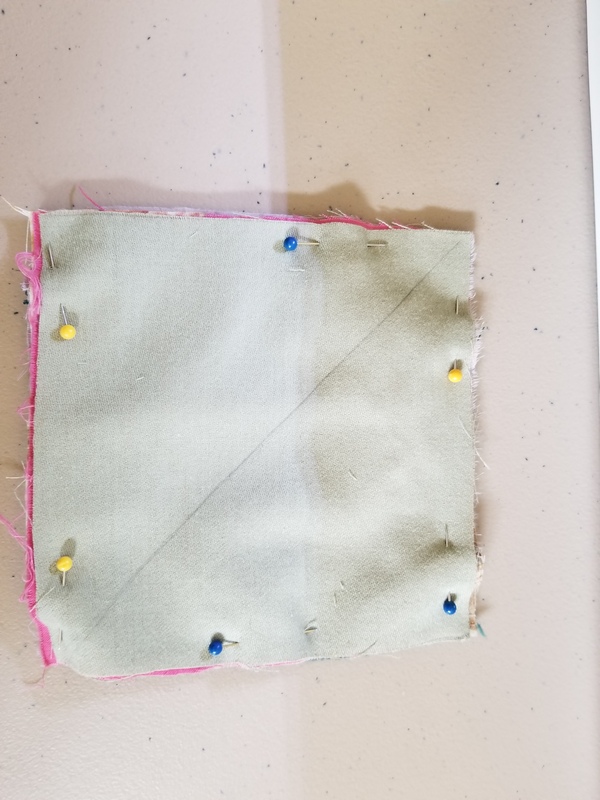 Paper fabric lamination is a technique of essentially gluing paper to sheer fabric in a specific design. 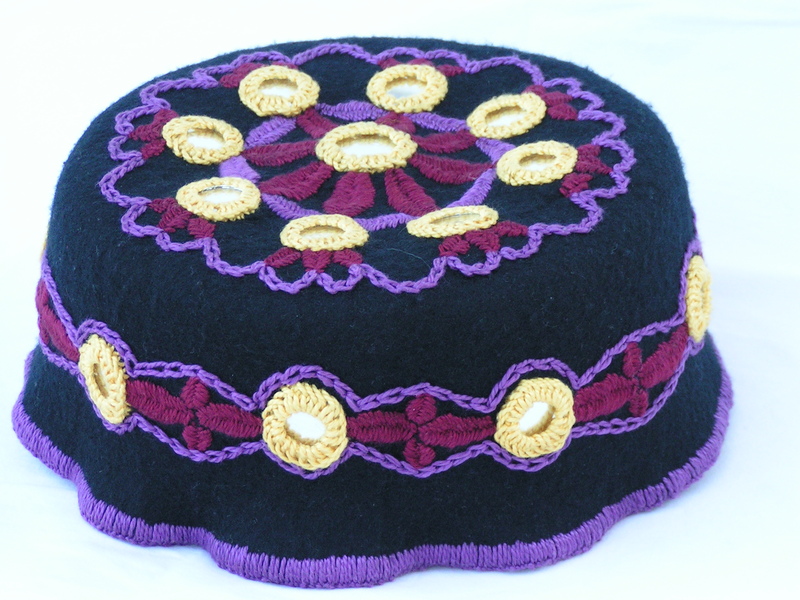 It is not a new technique and has been used by fiber artists for a long time. When I first learned the technique, I wondered how I would use the result. 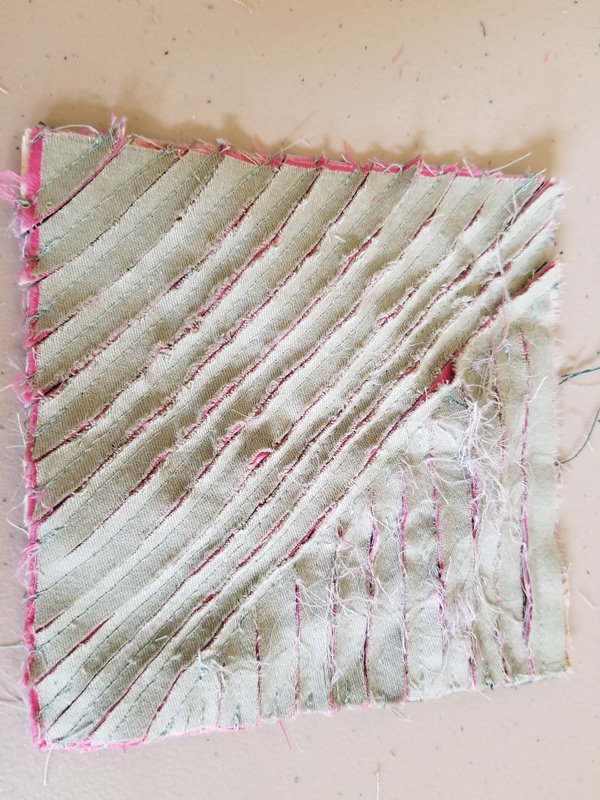 Many artists use paper fabric lamination and layer the results together with stitching and other methods. 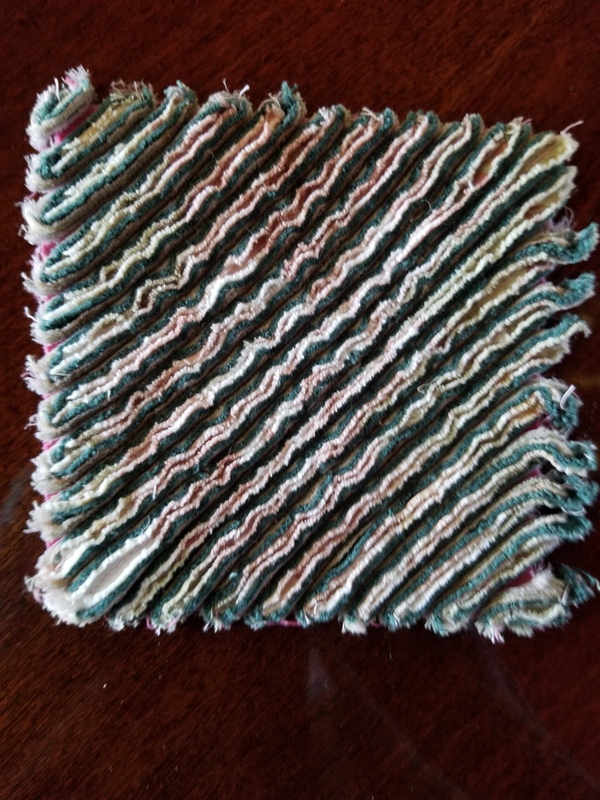 When I looked at my samples, I saw sheer fabric with a design and thought “Why not try nuno felting with it?” I tried it, it worked, and I loved the results. It was a way to use my own designs and create a piece of nuno felt that was completely different and in my own style. Click on the link above to register, scroll down the page and fill out the contact form. Screen printing has long been one of my favorite techniques and I love its quirky look on felt. This class shows you the basics of many different screen printing techniques and you will learn an experimental approach that will allow you to take these ideas and expand them into your own unique style. Click on the link above to register, scroll down the page and fill out the contact form. Click on the link above to register, scroll down the page and fill out the contact form. 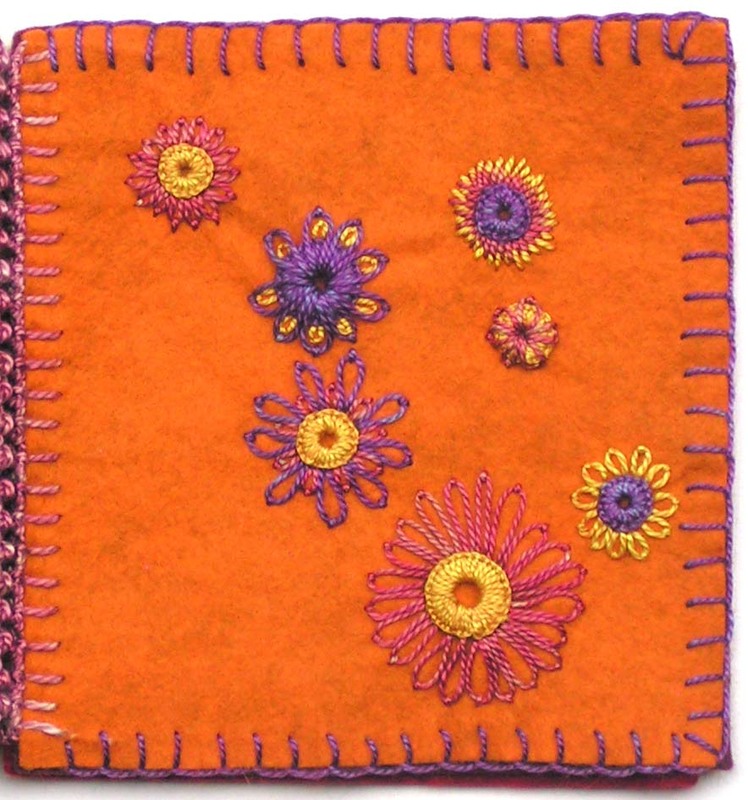 You will learn the basics of free motion stitching. I will show you the basic techniques and equipment needed as well as give you lots of practice ideas to improve your skills. 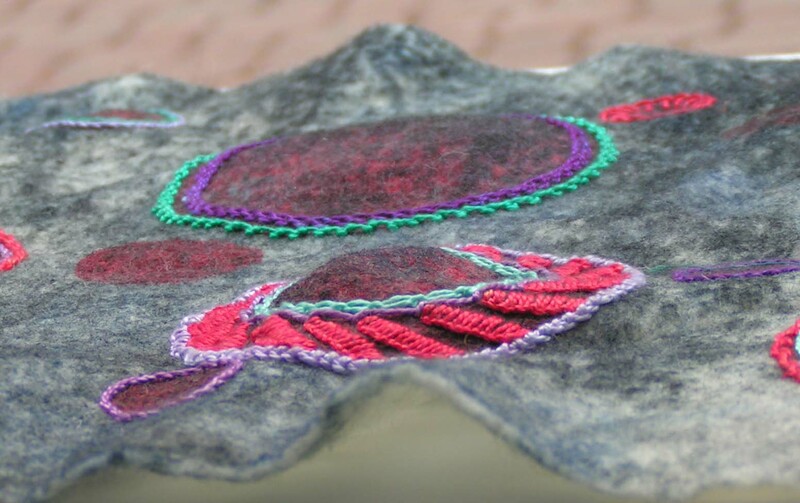 Next you will learn about machine lace techniques and how to incorporate them into felt making. 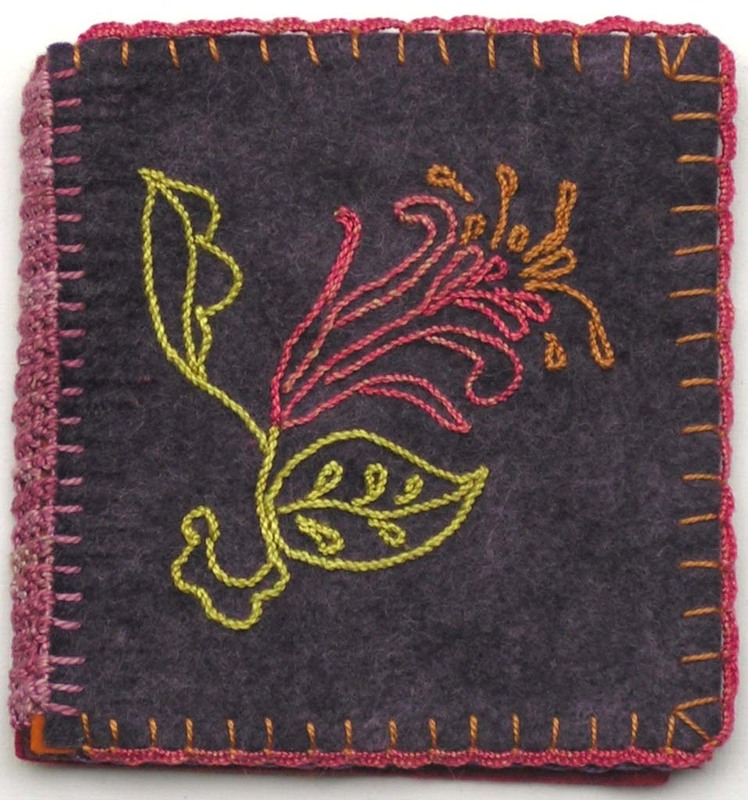 You will learn to use a hoop in the machine with water soluble fabric. Then learn about thread sketching. 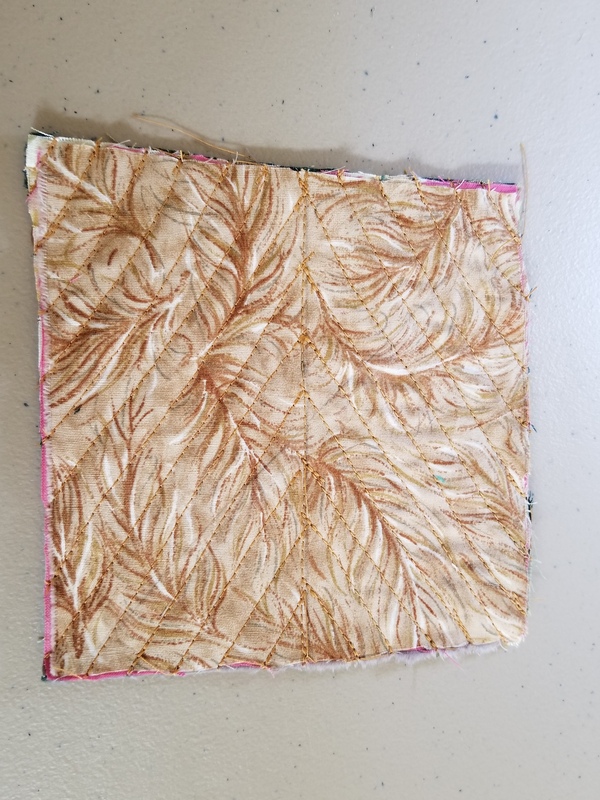 We’ll start out with easy designs and then progress to how to use water soluble fabric to transfer a design and free hand thread sketching. Lastly, you will learn about experimentation and moving forward with your newly found free motion machine skills. I will show you how to add stitch to a felt painting as well as other ideas in how to use your sewing machine to enhance felt. Click on the link above to register, scroll down the page and fill out the contact form. 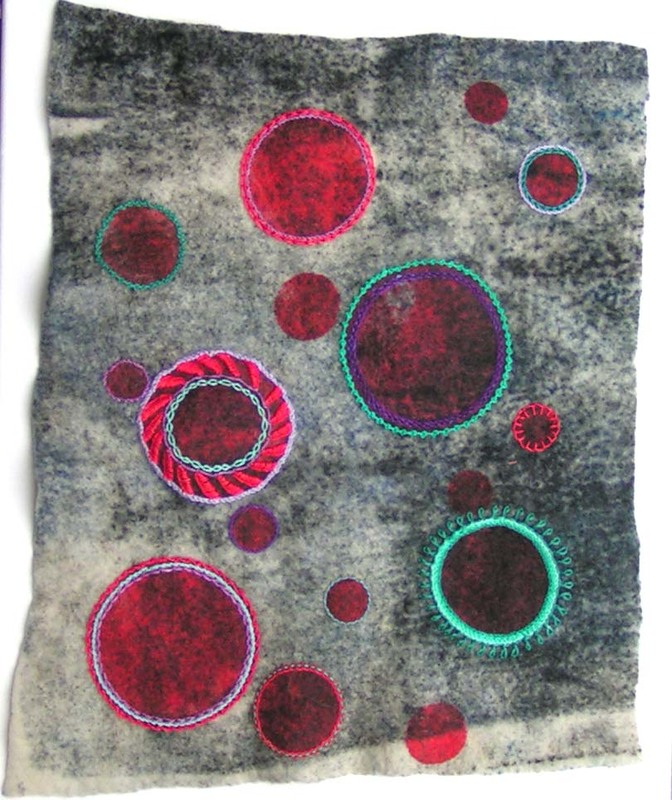 As always, our Wet Felting for Beginners Course is always available. Click on the link above to register, scroll down the page and fill out the contact form. Six more ladies – Workshop number six! So the other Saturday saw me heading to tutor another workshop, and as I said in the title, it was my sixth. How lucky am I to have filled six workshops? when I set out I had no idea if I would get one student! I took a picture of the lovely room we work in before everyone arrived. It is light and spacious. The tables are superb, they are three feet square and it is one per person. I would not want anyone to feel cramped. I do have a bit of a workout at the beginning of the day, dragging six of them together! Take a look how I had to tape the large plastic sheeting around the table leg in case anyone tripped on it as it flapped around the edges somewhat. I have to do a risk assessment at the start of the workshop to cover myself, telling people that scissors are sharp and not to put the soap in their mouths, I kid you not…. So let’s just dive into the pictures of the day. I hope you agree with me that these ladies were a talented bunch! They were a joy to teach, and as usual we had a lot of laughs. I soon get the measure of people and if I think they are up for a bit of banter, then game on! At the end of the day, we are there to have a fun time and play with wool! 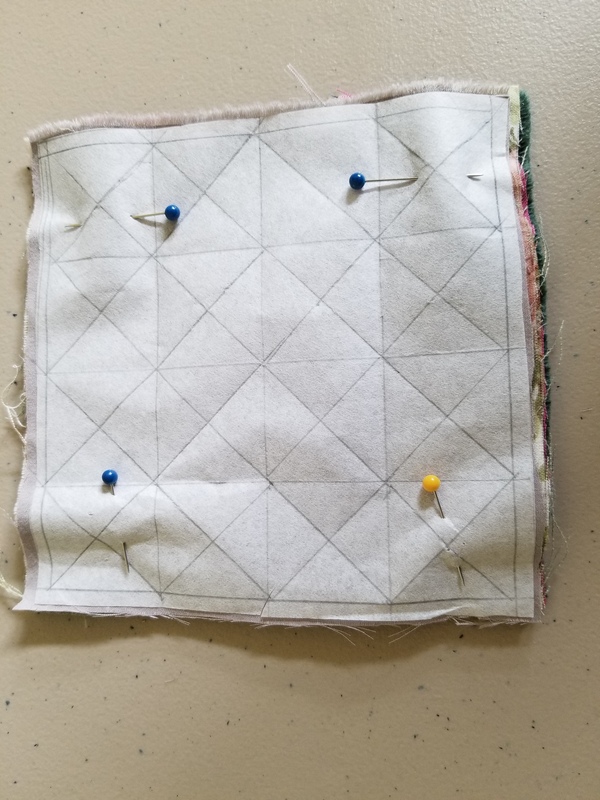 Additionally, I was asked by two of the workshop ladies, now friends, to teach them how to free motion sew the pieces made at the workshop. This happened recently, just a two hour class, and all went well, and they went away happy with their new knowledge. I made this piece using the batts too. 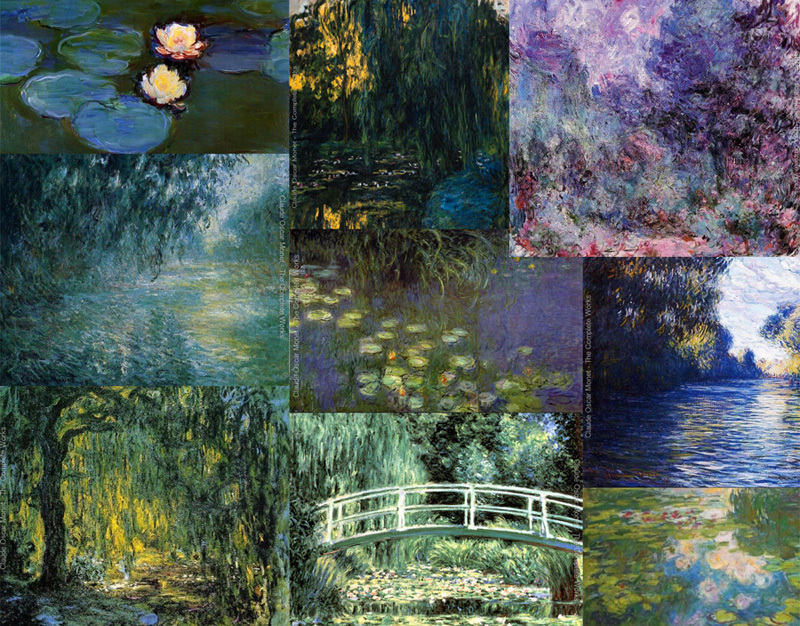 Neither of these first pieces copy Monet, they are just inspired by the colours. 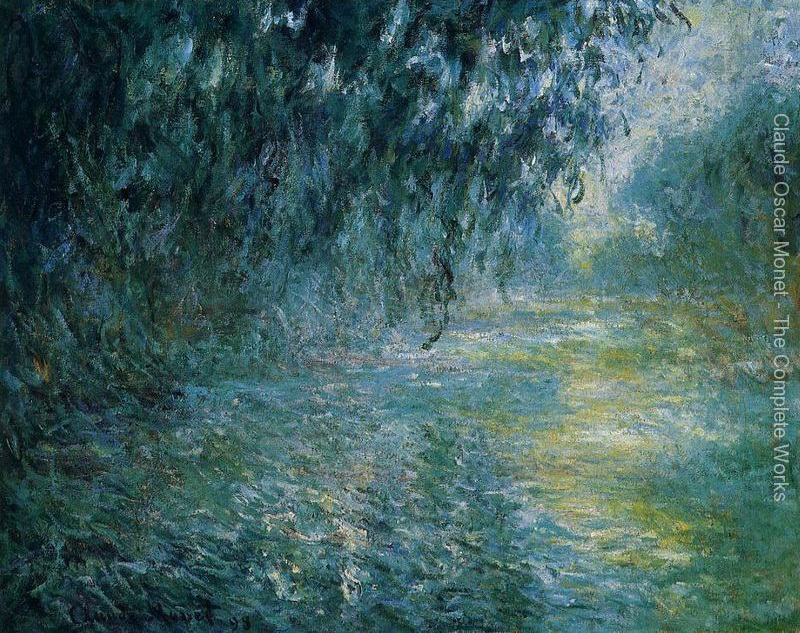 I wasn’t very confident I could do an actual ‘copy’ of a Monet painting, but I thought I’d have a go of at least doing an impression of a Monet piece 🙂 I chose Morning On The Seine In The Rain. I was actually quite surprised when this started to dry and it actually looked like something! I don’t know if it’s because I’ve stared at the original so much that I can see the similarity and that it’s meant to be it, but I’m pleased with how it turned out.